Weddings are notoriously expensive events for many families and would-be couples. Minus the honeymoon, the average cost for a wedding in the U.S. bounces between $19,182 and $31,970. Still, this is a formative event; a day that sets the tone for many years to come. After all, lasting wedding day impressions are easily made through atmosphere and setting alone. Our wedding barns demand a certain respect, as they’ve become great investments for property owners and event planners alike. But like weddings, they’re expensive. Several have homes all over the country, with the largest of our portfolio hosting gorgeous weddings and events in Arrington, Tennessee. And while wedding barns make for a spectacular day of ‘I dos,’ the same caliber of ambiance can be accomplished with a thoughtful outdoor design—all at a fraction of the cost. Outdoor weddings have climbed the ranks to become a formidable alternative to traditional church ceremonies. With more people opting for an idyllic natural setting, taking steps to enhance your scenic property can pay dividends for your business. Timber-frame pavilions are a great option for bringing your outdoor space up to par. A good structure, like any marriage, should be measured by its dynamism, as well as its durability. Outdoor pavilion kits offer an intimate feel without breaking the bank. Designed in our signature post-and-beam style, our pavilion kits are a symbol of longevity—the significance of which transcends its practicality. But a good structure, like any marriage, should also be measured by its utility and resilience. 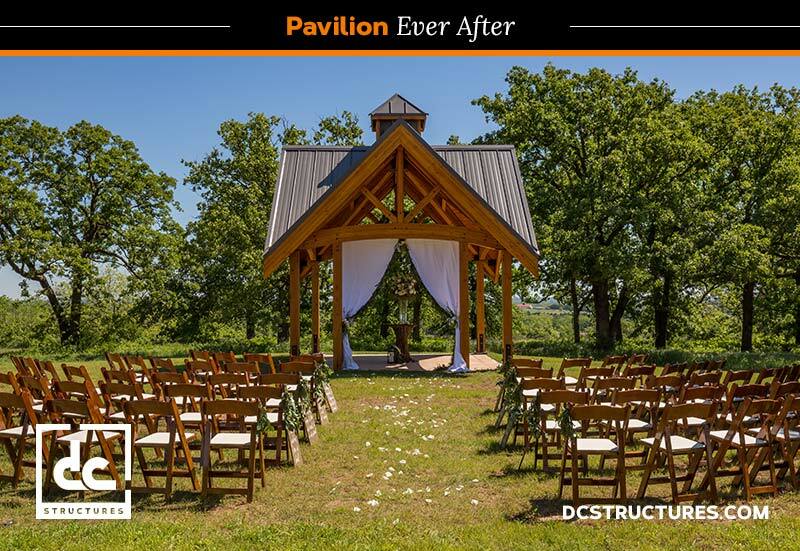 In other words, our pavilions make for great outdoor spaces long after vows have been exchanged. Between covered kitchens and outdoor fire pits, or special occasion gathering spaces for clients to rent, there’s no shortage of uses for these classic all-wood structures. Ready to take your wedding and event property to the next level? Request a free quote to get started today!